Help the refugees! Oppose both Taliban and army! 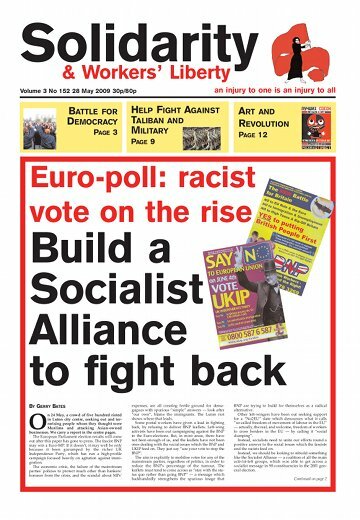 Euro-poll: racist vote on the rise. Build a Socialist Alliance to fight back! New strikes over jobs and union agreements have broken out in engineering construction similar to those at the end of January and the start of February this year. According to Contract Journal (19 May), the dispute started with 50 laggers walking out at the South Hook Liquified Natural Gas terminal in Milford Haven. On 25 April, North Korea conducted its second nuclear test in three years. It followed this up by restarting its main nuclear reactor, threatening to attack South Korea if it joins US-led inspections of ships suspected of carrying nuclear weapons, and firing five short range missile tests to show its teeth. The regime walked away from talks last month after the UN Security Council condemned its test-launch of a long-range ballistic missile. Now the Security Council is threatening to strengthen the economic sanctions already in place against North Korea. Anti-cuts campaigns seem to cut deep. At Edinburgh University, details of £400,000 of cuts within the Division of European Languages and Cultures were leaked by a courageous member of staff to the Students’ Association. The reasons given were the “current climate” and the lack of profit made by the department. TUBE: Drivers on the London Underground's Victoria line struck on 20 May to reverse the unjust sacking of driver Carl Campbell, a sacking which had just been upheld, and demand new safety equipment on the line. Maria Exall, a member of the Executive of the post and telecom union CWU, spoke to Solidarity about the union's conference coming up on 7-11 June. Bob Sutton spoke to two Midlands carworkers about the jobs fight, the construction workers’ action, and the environmental issues in their industry. We’re all waiting to see whether we're going to get the guarantees from the government for the £140 million from the European Investment Bank. Otherwise it’s very much hand to mouth at the moment. The crisis in the US car industry is leading quickly to savage attacks on working class pay, conditions, jobs and pensions. When Chrysler went bankrupt recently its assests were sold to a new entity headed by Fiat. As part of the deal Chrysler workers were offered “control” over the company. But, as the following comments from US journal Labor Notes, show these auto workers are being taken for a ride. The Iraqi Teachers’ Union is facing a vicious attack from the Iraqi Government. The Iraqi government has demanded that the leadership of the union hand over the keys to its headquarters, along with membership and other records, to a state body.